In Grand Theft Auto IV and Grand Theft Auto: Chinatown Wars, Francis International Airport (FIA) is an airport situated in Dukes, Liberty City. 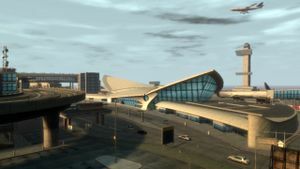 The airport takes its name from an older rendition of the airport in an older rendition of Liberty City, but is otherwise completely redesigned. It is bordered to the north, south, and east by the ocean; the Broker-Dukes Expressway to the northwest (Meadows Park); Tudor Street to the west (Willis); and Saratoga Avenue to the west (Beechwood City). The airport is based on terminal 5 at J.F.K. Airport in New York City, while the runway design emulates that of LaGuardia Airport, also in New York. It is both Liberty City's largest (in land area terms) and most easterly neighborhood. Francis International is even larger than other large city districts such as Acter Industrial Park and Alderney City in Alderney. The airport is serviced mostly by FlyUS and their fleet of Boeing 747's (which seem to be the airport's only air traffic), and a handful of Shamal-based planes. Found around the airport are signs for "AdiosAir", however this is only indication of a rival airline. FIA has several jets (similar to Bombardier CRJ-100's) parked nearest the helipads and southern most entrance; some in FlyUS' express theme, some are private business jets from various countries. Three Annihilator helicopters parked on three helipads can be flown in multiplayer. In single player, one Annihilator is found once the player has killed all 200 flying rats. Hangman's NOOSE always start here (see article for details). Also, Team Deathmatch games can be started here. If one is started, make a beeline for the choppers. If you can't fly them, make sure no enemies gets inside of them. Upon entering the runway or certain inner grounds of the airport during single player, the player receives a four star wanted level and a fleet of NOOSE Crusiers or NOOSE Patriots, FIB Buffalos and NOOSE Enforcers will give chase and stop the player with whatever means necessary. In GTA Chinatown Wars, entering the runway does not give the player any wanted level. None of the airplanes have any logos on them. Airplanes including large jumbo jets and small private jets can be seen taking off and landing on the runways but they don't move from or to the taxiways. The PS3 version of the game has a bonus mini-level, the Sixaxis Tutorial which takes place on the tarmac. During the tutorial the wanted level is suspended, which allows the player to easily access a shotgun pickup that would normally trigger the wanted level. Within the airport's boundaries are a police precinct just off the Broker-Dukes Expressway, south of the Willis access road, as well as a fire department, just south of the passenger terminal. The Broker Line runs through the Francis International Airport station, providing arrivals to the city with quick travel to the rest of the city and departures easy and convenient access to the airport. From the road, the most convenient access to the Airport is offered by expressway exits. Both the Broker-Dukes Expressway and the Algonquin-Dukes Expressway possess exits to FIA. There is also an access road from Willis; this can be reached from Tudor Street. Alternate angle of terminal building in GTA IV. Airport terminal, with a large number of parked FlyUS planes around the airport. Wide view of the airport looking towards the southwest. Upon entering the tarmac area, the player's wanted level will quickly change to 4 stars, regardless of the previous level. So, one could lower their 5 or 6-star wanted level to 4 stars. This is apparent in the Xbox 360 version of the game. Although if you hover in a helicopter, you will only get a 2 star wanted level. It is also possible to enter the terminal building, by a glitch, but since it wasn't intended to be accesible, it will have no interior. Francis International Airport is a perfect place to obtain three GTA IV achievements: Walk Free, Wheelie Rider and Rolled Over. To gain the "Walk Free" achievement, the player has to obtain a fast car, such as a Comet, Turismo, Infernus or FIB Buffalo. Once the player has obtained a car, they are to drive to the last entrance to the FIA. Once the player reaches the entrance, drive onto the terminal using the road provided, turn left and continue driving down the runway until the player is out of the search radius. The player should then gain the "Walk Free" achievement. This video will show how. To gain the "Wheelie Rider" achievement, the player has to follow these steps: first the player is to obtain a Sanchez. Once the player has obtained one, go to the runway at the airport. The airport run is a nice, big, long, straight road to try this Achievement/Trophy on. The player will gain a 4 star wanted level, but since the player is driving quickly done the airport, the cops will barely catch up. Start at one end, and pull back slightly to start a wheelie, and try to hold it. Hold it for a good 15 seconds to get the Achievement/Trophy.This video will show you how. To gain the "Rolled Over" achievement, the player has to obtain a fast car (like the Comet, Turismo or Infernus) or a car that rolls well (like the Taxi or Police Cruiser). Once the car has been obtained Take it out on the runway and hold down the accelerator. Aim for the yellow markers in the grass median. Line up the car so that the left or right half of wheels will hit the edge of the yellow marker. When you do this the car will flip at least two to three times. Hold the accelerator down the entire time and keep jumping off the markers until you get the achievement. You MUST keep the accelerator pressed the entire time. Since it doesn't count the 5 rolls by crashes, but by rolls done by the same car in a short period of time, you can just keep trying over and over until the Achievement/Trophy pops up. This video will show you how. This page was last modified on 19 July 2013, at 17:14.